nKarta TM OD Black Flip Flap Wallet Pouch Mobile Cover Case with Card holder Slots for Huawei Honor Holly 2 Plus@245 Rs [Mrp:-245] - Onlinedeals.discount - A leading product discovery website. Find the true prices of products, read reviews and buy top brand products at reasonable prices. Protects screen from unnecessary scratches. • Ultimate protection for your mobile. • Premium quality PU leather with great craftsmanship. • Perfect fit for travel and carrying your mobile. • Inside of case is made of material that will not scratch your phone. Protect your Mobile’s screen from harm without impacting it’s super slim profile. • The cover is made for rough and tough use enough to withstand day-to-day punishment without blemishing. 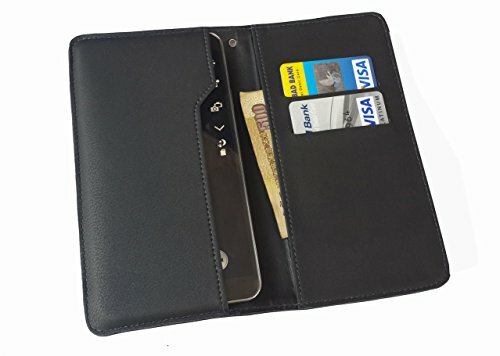 • A great unisex mobile pouch carries 3-4 cards and money on the go..